RALEIGH, North Carolina (Reuters) - Usain Bolt and Tyson Gay, the world's two fastest men ever over 100 meters, will race in New York, London and Brussels next year, athletics sources told Reuters on Wednesday. The sources said former world record holder Asafa Powell would take part in the European races and could join the pair in New York. New York's meeting is set for June 12, London is scheduled for August 13-14 while Brussels concludes the new Diamond League's 14-meeting season on August 27. 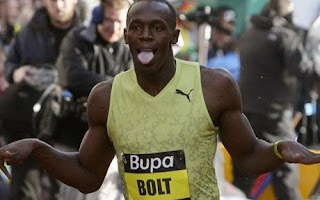 Neither the International Association of Athletics Federations (IAAF), the athletes' representatives nor organizers have confirmed their Diamond League schedules, but Gay said over the weekend: "I will be racing Bolt at least three times." Bolt and Gay last met in a non-championship 100 meters at New York in 2008 where Jamaican Bolt set the first of his three 100 world records. He also holds the 200 meters mark. Bolt, American Gay and Jamaican Powell swept the three world championship medals in Berlin last August. All three are under contract to the Diamond League to appear in seven races on the circuit, which will replace the six-meeting, European-based Golden League. Each of the 14 Diamond League meetings is guaranteed at least one of the three sprinters with several having two and a select few all three. Bolt and Gay are likely to include both 100 and 200 meters races in their seven-competition schedules with Powell running the shorter distance exclusively. "Everyone in the entire world wants to see the three of us together a lot more so it's going to happen," Powell said at a weekend launch of the Diamond League in Monaco. Bolt added: "It's going to be awesome so, people, look out,"
Circuit organizers are not likely to begin announcing athletes' schedule until late this year or early next year, IAAF spokesman Nick Davies said. "We are still working on Usain's schedule," his agent Ricky Simms told Reuters in a telephone interview. "I can confirm he will run in seven races." Gay's schedule depends on the American record holder's recovery from recent groin surgery, manager Mark Wetmore said. "We are really not in position to make final confirmation about his meets until after the first of the year," Wetmore said via telephone. "He is very interested in running the two U.S. meets." The U.S. meetings are Eugene, Oregon, on July 3 and New York. Powell will help inaugurate the Diamond League season with a 100 meters race in Doha on May 14, his agent, Paul Doyle, told Reuters. Other meetings are planned for Shanghai, Oslo, Rome, Lausanne, Gateshead, Paris, Monaco, Stockholm, Zurich and Brussels.